Following three years of revision by ISO CASCO Working Group 44, the third edition of ISO/IEC 17025 (ISO/IEC 17025:2017) was published by ISO on 30 November 2017, and has been adopted by BSI as a British Standard. A copy of this new edition can be purchased from BSI Online. An ISO brochure has been published that summarises the key changes. It has already been agreed that a 3-year transition period (from date of publication) will be allowed for accredited laboratories to make appropriate changes and transition to this new edition. 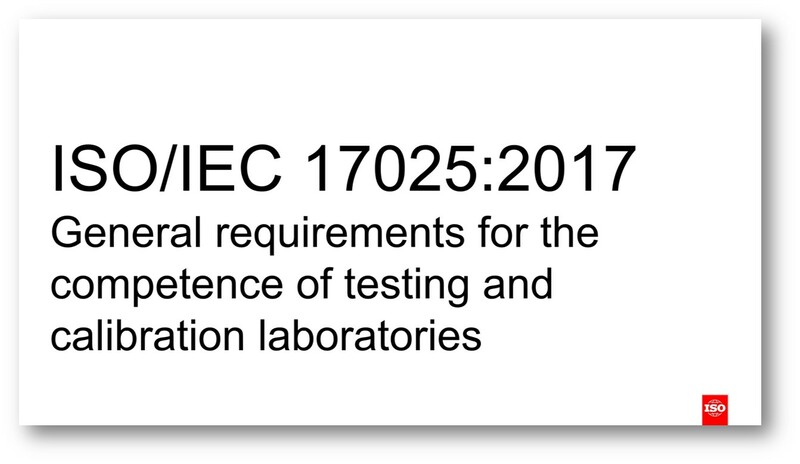 Accreditations to ISO/IEC 17025:2005 will cease to be valid from 30 November 2020. Further details on the UKAS transition process shall be published on the UKAS website shortly. To help laboratories understand the changes, together with their rationale, UKAS has developed a 1-day awareness seminar (ISO/IEC 17025: 2017 Seminar, Awareness for Transition) that will run around the country throughout 2018 and into 2019: Details of this seminar, together with joining instructions, can be found here. Alternatively, if laboratory management and staff wish to undergo more detailed training on all aspects of ISO/IEC 17025:2017 then details of UKAS’ three-day ISO/IEC 17025:2017 training course can be found here. UKAS was involved in the drafting committee of CASCO WG44, and also chaired the UK mirror committee that provided input into the revision process. As a consequence, the UKAS presenters are well placed to explain the reasons behind the changes and the intentions of new requirements. Through direct involvement in the CASCO Working Group revising ISO/IEC 17025, UKAS was able to keep fully abreast of the changes being proposed. This has enabled UKAS to develop a transition process that will ensure an effective level of assessment to confirm ongoing conformity with new requirement, whilst not posing an excessive burden to laboratories. It is important that laboratories purchase a copy of the new edition, and understand the changes that have been made, at the earliest opportunity. To help focus efforts, UKAS has prepared a form that broadly identifies where changes have been made, and whether these are considered major or minor. As part of the transition process laboratories shall be required to complete this form to state what they have done to meet these new or changed requirements, which will then need to be submitted to their UKAS assessment team for review. The information provided will then be used by the assessment team at its routine annual visit to verify that the laboratory has updated its systems and process sufficiently to demonstrate conformity with the new edition. Any finding raised will need to be addressed in the normal way before accreditation can be transferred to ISO/IEC 17025:2017. Download a copy of the form. 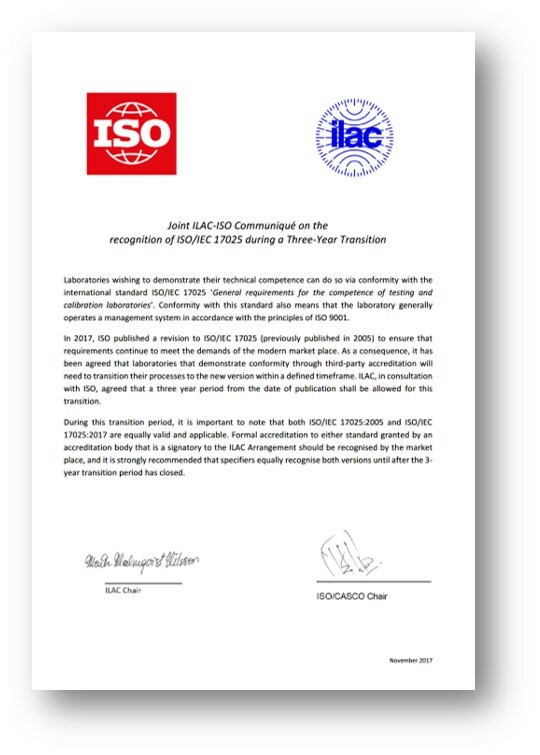 ISO and ILAC have issued a joint communiqué that accredited laboratories can provide to purchasers to demonstrate that both versions of the standard remain valid during the three-year transition process. This can be downloaded from the ISO website. ISO has also produced a video to promote the new standard, with contributions from the three convenors of the revision working group. An ISO presentation is also available that sets out the revision process, the objectives of the revision, and a detailed review of changes and updates. ILAC / ISO communiqué to provide to purchasers. 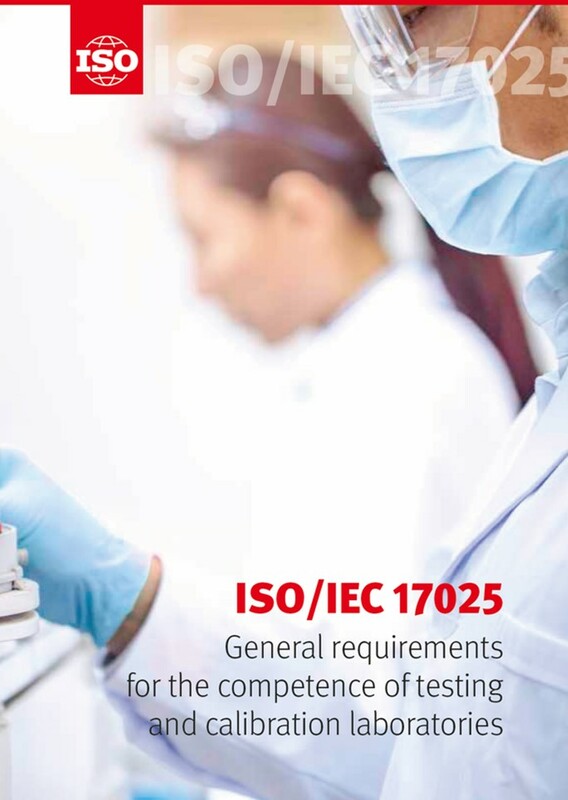 ISO/CASCO is seeking feedback from testing and calibration laboratories on the 2017 version of ISO/IEC 17025. This will help prepare their first analysis of the feedback one year post publication of the revised standard. ISO/CASCO has emphasised that they are seeking information specifically on the 2017 version of the standard in comparison to the previous version and therefore request that only those conformity assessment bodies that have started implementing the standard respond to the survey at this time.